Have you seen an alpaca before? We saw two before at Ueno zoo in Tokyo. Japanese think alpacas are cute. I've always wanted to make an aplaca bento but somehow did not have the motivation to make one till a couple of weeks ago. 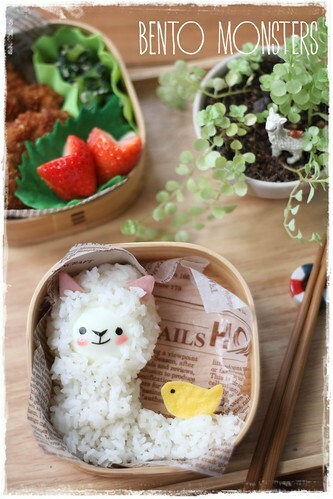 I happened to buy a potted plant with an alpaca figurine and got inspired to make a matching alpaca bento. 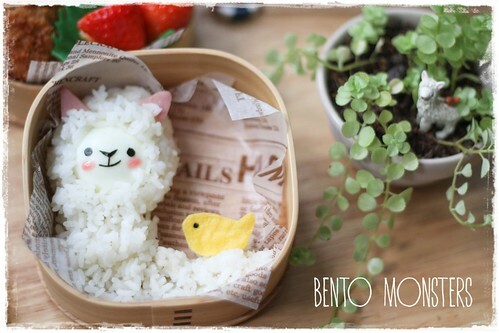 Alpaca was made using rice, hard boiled egg, ham and nori. Bird was made using egg sheet and nori. I have to make a full body alpaca next time. 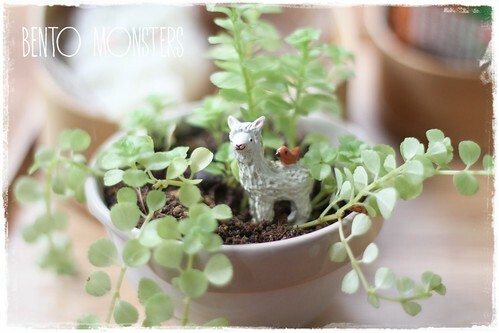 Can you spot the alpaca figurine in the pot on the right? Here's a closer look at the figurine. Isn't it cute? I've seen really cute alpaca soft toys before as well. So so cute! I love your Alpaca! Too cute!!! Pretty as always..